Buck’s a gorgeous paint gelding who’s been at Turning Point for eight years! Unfortunately, he’s been on stall rest since August, due to a very nasty and deep abscess. Dedicated donors make it possibe for riders like Ander find success at Turning Point. Our riders have a lot of fun, but they're also working on important life skills. Some need muscle tone or balance. Turning Point News: Fall 2018 was EXCITING! "Little Black a Pony" by Walter Farley is a great place to start! 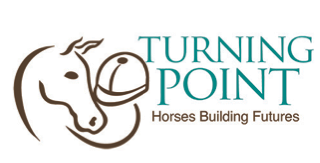 For the past six years, Turning Point has provided the book to each first grader at Highland Park Elementary. OK...they aren't very green in January, but that's why we need volunteers to feed and water our herd year round. And keep an eye on the herd dynamics.